Rabbits like this one stand out against the white snow making them easy to hunt in the winterRabbit hunting is fun and can be very exciting. 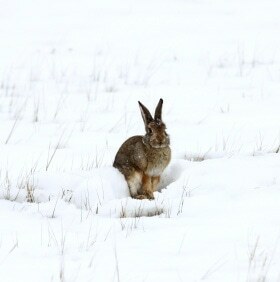 Winter is a "prime time" for rabbit hunting because you can spot cottontails fairly easily against the snow. Of course, it's a little tougher to spot Snowshoe hares in the winter because their pelts are white in the winter months... but, on the positive side, they are somewhat larger, and provide more "meat for the table." First, walk through the woods quietly and slowly, and spot out thickets, i.e. brush piles, old log piles, a downed tree, etc. If an area is clear-cut, look for a jumble of brush and branches. These are the places where rabbits live. Most live under some type of brush pile (not too many are like Bugs Bunny eating a carrot in a hole), some rabbits indeed do live in holes, but the great percentage live in the thickets above ground. Rabbits always make sure they have several escape routes because predators seek them out in the same places you are working. Try to "jump shoot" (that means surprise or "jump") the rabbits when they are out and about. Walk up on 'em, and they'll definitely react to your presence by scooting out running. Watch ahead of you. Watch for movement. Hang around the brush areas. It's normal to want to shoot at the rabbit the instant it starts running, but DON'T! Almost 100 per cent of the time the rabbits will literally "run in a circle" and come back to where they just were -- and then they'll stop! This will give you a really good shot at a non-moving target! Some of the more serious rabbit hunters use dogs. Beagles are real good for this as they're small, short haired, and will get down in the brush easily, chasing rabbits back in a circle right to you. Just follow the beagles. Having said that, it's more relaxing and a lot quieter hunting rabbits without dogs. No barking or yelling -- it's nothing more than a personal observation and preference. As for what to hunt with: "Traditionalists" like to use a bow and arrow. It's real. It's a challenge, and the wonderful natural silence of nature in the woods is unblemished. Most opt to use a shotgun when going after "Thumper." Use number five- to seven-size shot. A 20 gauge -- even a .410 is just fine. To use a 12-gauge Remington pump is overkill. Many rabbit hunters don't like to use shotguns. They feel that the shot tears up the flesh on an already-small animal, and they don't want to pick lead pellets out of the meat after cooking. So they use a .22 long rifle. Works real good, but you do need be a pretty good "snap shooter" to use a .22, because there isn't a lot of time to aim, and people who aren't real skilled can, and do, miss with some consistency. Shooting range will, of course, vary. Rabbits are not the brightest of animals. You can get pretty much on top of them. They'll be right in front of you. Ten to twenty yards is great. Indeed, Phil Schweik reports many times where the rabbits have run right up to him! A final note: Rabbits are infested with fleas which can be a turn-off when it comes to rabbit hunting. Here's a suggestion that may help alleviate the problem: After you've shot a rabbit, let its body "cool down" for a couple of hours... Fleas want "warmth," and after the rabbit is dead, most of the fleas will "jump ship" as soon as the body cools!